It's 22:54 in Central Lake, USA right now. KenCam Live view of backyard in Central Lake, Michigan with snow conditions, birds and small animals feeding, and links to weather forecasts. Beulah, Michigan: Platte Lake, 50.5 miles away. Gerrish, Michigan: Higgins Lake, 52.2 miles away. Houghton Lake, Michigan: Houghton Lake Webcam, 56.7 miles away. Tustin, Michigan: Several Views, 67.5 miles away. 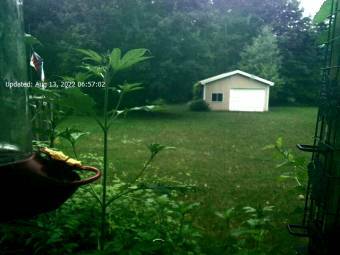 Alger, Michigan: River View Campground & Canoe Livery Moffatt Landing Cam, 86.2 miles away. East Tawas, Michigan: Tawas Bay, Lake Huron, 102.9 miles away. Fremont, Michigan: Fremont High School, 115.7 miles away. Bay City, Michigan: Killarney Beach, 122.5 miles away.